Bistronomie is still a welcome culinary trend in Paris after 10 years. Rediscovering L’AFFRIOLE, one of my favorite restaurants in the French capital. The term, a contraction of bistrot and gastronomie, which was invented 9 years ago by Sébastien Demorand , the restaurant critic for Zurban , a magazine that was published in Paris between 2000 and 2006, is self-explanatory. It defines small informal but usually nicely decorated restaurants launched by already famous chefs, or by their sous-chefs who want to open their own restaurant. They are usually serious professionals who want to bring back good quality cuisine, traditional but inventive, at reasonable prices in a simple and unpretentious environment. Gone are the fancy white table cloth, expensive silver, crystal chandeliers, pricey art on the walls, and over serious or arrogant waiters. In Bistronomique restaurants the creativity of the chef, the attractiveness of the wine list, and a service that makes the diner feels welcome, even during his first visit, are the key to success. The location is also important bot not necessarily as it would be in a Michelin-starred establishment. In brief they are bistrots offering authentic gastronomy based on good quality products, and a solid know-how of French traditional cooking techniques. They often reflect a sense of the kind of modern, even trendy, dishes the contemporary customers expect from a well-known chef, but their menus indicate prices that remain affordable, thanks to a limited staff and a complete absence of bling and “froufrous”. Most bistronomique restaurants in Paris offer a 3 course dinner menu under 40 Euros. But of course some bistronomique restaurants owned bybig name’’stars’’ of the trade charge much more. I will not mention those here. You have to know that nowadays 70% of French restaurants cut their expenses by limiting their creativity and assembling dishes whose components have been industrially produced and packaged by huge food plants, from pâtés to desserts. So it is comforting to know that most of the well-established “bistronomique” restaurants buy their products in local stores or directly from French producers, and often select themselves their fruits and vegetables at the central ‘’halles’’ of Rungis, South of Paris. Then they prepare them in their own kitchen with the help of competent professional cooks. Over the last 15 years, I derived my most pleasant memories from restaurants that propose a ‘’cuisine bistrotière’’ or ‘’ cuisine du marché’’ rather than from the famous gastronomic, and often very impressive, starred restaurants where I was very often invited by professional contacts during my many years of frequent traveling to France on business. Now that I am retired and traveling on budget, small neighborhood family-owned bistrots, both traditional French or ‘’ethnic’’, are my favorite eateries. I also privilege those that belong to the French Associations of Maitres Restaurateurs whose members, all independent restaurateurs, share a commitment to obey the principles of an audited Chart of Quality that guarantees that they renew some of their dishes several times a month, that all their cooking is made on the premises with essentially fresh products purchased from non- industrial sources such as artisans and family-owned farms. They also insure that the environment of the restaurant itself is safe and healthy, that the presentation of both the table appointments and what is in the plate, respect the traditions, and that the dining room and management staff welcome the customers with a pleasant and well-informed behavior. Their menus and dishes should always be precisely written, and the prices truthful. All the restaurants that are present members of that association post a recognizable logo on the window near the entrance of the restaurant. In Paris, the most popular “bistronomique” restaurant is perhaps Le Comptoir du Relais, 9 Carrefour de l’Odeon, in the 6th arrrondissement in the Hotel Relais Saint Germain. Since its launching in 2005 by Yves Camdeborde, this very tiny bistrot has been refusing customers every day. Unless they are sent by the hotel for the dinner service inside. Open for lunch and dinner its outside tables on the minuscule heated sidewalk terrace are very looked after, even in grey and cold weather, and very difficult to get. 3 weeks ago I stopped by at 3:00 PM to have a glass of wine and a plate of cheese and the waiters were busy folding blankets on the chairs outside for the evening customers. The waiting lines are long and the waiting staff not always pleasant. But some of the typically ’’brasserie’’ type dishes such as milk-fed roasted piglet, poule au pot, or boudin (blood sausage) are made from high quality products and until a couple of years ago were reliably good. I understand that recently the quality of some dishes has become inconsistent. But the prices are still relatively mild for this district. I remember that La Régalade, the very pleasant restaurant in the 14th arrondissement, that Camdeborde opened in 1992 and sold in 2004 and made him a celebrity chef, built his success on very simple ‘’country’’ dishes prepared with a lot of gastronomic flair. Like many of his ‘’bistronomique’’ colleagues, Camdeborde was trained in the kitchen of the famous Les Ambassadeurs restaurant in the Hotel Crillon by its former iconic executive chef Christian Constant. Le Violon d’Ingres, his flagship restaurant which can be considered in spite of its higher prices, as an ‘’ Upper’’ bistronomique restaurant, Les Fables de la Fontaine, Les Cocottes. And the delightful Café Constant, one of my favorite mini-restaurants bistronomiques in Paris. Chez l’Ami Jean of Stéphane Jégo (27 Rue Malar in the 7th arrondissment) who cooked for Camdeborde at la Régalade for many years. Little B of Dominique Bouchet , an ex-chef at the Tour d’Argent and the Crillon (11 Rue Treihard in the 8th). L’Os à Moelle of Thierry Faucher, who also worked under Christian Constant at the Crillon, (2 rue Vasco de Gama in the 15th ). L’Ourcine ( 92 Rue Broca in the 13th). I used to love Le Troquet of Christian Etchebest, another alumnus of the Constant ‘’school’’, (21 Rue Francois Bonvin in the 15th) But I read that he sold his restaurant. 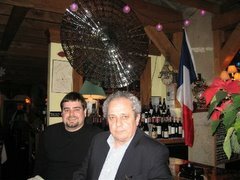 For me the most illustrious veteran of the bistronomie in Paris, and probably one of my favorites but I have to admit that I have not been there for at least 7 years, is François Pasteau, who launched his L’Epi Dupin (11 Rue Dupin in the 6th) in 1995, long before bistronomie was even a trend. His restaurant, that has been recently completely redesigned and redecorated, is a model of what a good bistronome should expect from an authentic ‘’cuisine du marché’’. His dinner menu at 33 euros is perhaps one of the best deals in Paris in 2012. But the reason I gave up going there is that it is always too crowded, for a large part by noisy Americans, and that the waiters always give you the impression as soon as you have placed your order that they expect you to eat fast and leave, which diminishes most of the fun of eating Pasteau’s great creative dishes. I had lunch there with my sister in November and a month later I still can feel on my taste buds the aroma and the marvelous blend of gustatory sensations that I loved during this meal there. This is a small restaurant that can seat a maximum of 45 diners at 17 rue Malar, on the same sidewalk as Chez L’Ami Jean mentioned earlier. The décor is very contemporary and simple: Colorful chairs made of plastic, large ceramic tiles, nice lighting, a large blackboard where you can read the daily specials. The restaurant used to be a bit more intimate and the décor more traditional when I ate there for the last time 7 or 8 years ago. I always wanted to come back so impressed that I was at the time by both the superior quality of the food, and the charm and total lack of pretension of the place and its reduced staff. I had reserved 2 days in advance for that Saturday lunch since I had read that this place is so popular with both local regulars and educated foreign gastronomes, that it is always packed, even at lunchtime. The welcome by the gracious and multilingual co-owner, Maria Verola, is as pleasant as I remembered it. And the cooking of her husband Thierry Verola, a very gifted chef who spent some time in the kitchens of Alain Senderens ( Lucas Carton that morphed into Le Senderens on Place de la Madeleine) and Jean-Paul Duquesnoy, is more tasty and creative than ever, even though it is based or often adapted from very traditional French regional recipes. Verola is a native of the region of Auvergne, in South Central France, where there is a long tradition of solid and tasty fare based on recipes transmitted in families from one generation to the next. It is also the region where some of my favorite French cheeses such as Cantal, Saint-Nectaire, Fourme d’Ambert, and Salers, are produced. Thierry Verola took over this restaurant about 12 years ago. And it did not take long to attract connoisseurs of “real food” and astute restaurant critics who recognized the merits of a chef so attached to the importance of good products and how to treat them well with honesty and technical competence. L'Affriolé as been awarded a Bib Gourmand in the Michelin Guide. Its menu-carte, that combines the regular menu and the specials hand written everyday on the chalkboard, changes every month, according to the seasons, and what he finds at the market in Rungis. But some perennial signature dishes have been regularly offered for as long as 10 years. (main courses), and 5 desserts. (in fact it could be 6, I am not sure anymore). The menu costs 25 euros at lunch time, and 35 euros for dinner. But for lunch the restaurant propose less expensive but equally attractive ‘’Formules’’ where you can choose an appetizer and a main dish, or a main dish and a dessert . But it will cost you a little ‘’supplément’’ (a few extra euros) if you choose some of the delicious daily specials that are so appealing that it is tough to make a decision. When we were seated, we were quite pleasantly surprised by the beautiful complimentary amuse-bouche that was already waiting for us on the table: a plate of very fresh small spring radishes, a tiny bowl of coarse sea salt, and a perfectly baked ‘’baguette en épis’’ that accompanied a bowl of addictive black olive-butter. When I was young in the late 50`s we used to call it a ‘’ baguette YéYé’’. This specialty baguette is made by a master pastry chef and baker , Stéphane Secco, who owns one of the best bakeries in Paris on a nearby street. My sister had a very delicate appetizer of scrambled eggs with truffles, and an incredibly rich ‘’joue de boeuf braisée au vin rouge’’ (braised beef jowl in red wine) with risotto (or perhaps the ganiture was instead mashed potatoes… I may be wrong on this). I had one of the signature dishes of Thierry Verola, ‘’croquettes de pieds de porc’’ (deboned and chopped pig feet meat, lightly sauced , shaped in a crumbed cylinder and fried) with an excellent home-made tartar sauce and a scrumptious Pâté Pantin, consisting of very tender small pieces of deboned quail (or perhaps young poussin) with foie gras and baked , totally enclosed, in a perfectly flaky light crust . With a delicious Italian espresso they serve usually miniature pots de crème and tiny marshmallows scented with with orange flower . These are complimentary. The restaurant is closed on Sunday and Monday. The closest Metro station is La Tour Maubourg or Pont de l’Alma, but this one is on the other side of Seine River. It is easier to go there by taxi.